A psychic girl with a goth-like appearance who has the ability to sense people's "auras" and send out electric waves (denpa). Much like Arisa, Saki is extremely protective of Tohru, who was the first person in school who had truly accepted her. She is very observant, polite and loves to eat (and is rarely seen not eating outside of school). Her nickname Hana-chan and her manga symbol, a violet with fangs, relate humorously in that hana means "flower" in Japanese. Hanajima has a close relationship with her family who accepts and even nurtures her gifts. Her younger brother, Megumi, looks up to Saki and has his own special ability so that she won't be the only "weird" one in the family. Her mother seems to resemble Tohru's protective and caring nature (possibly explaining her attachment to Tohru). 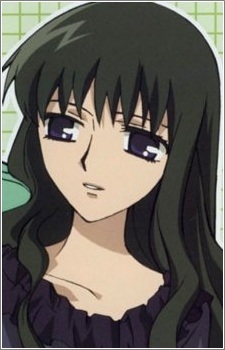 In the near "parental" protection she and Arisa give Tohru, she acts as the protective "motherly" figure. When Kazuma comes in for Kyo's parent/teacher conference, Hana notes that he is "handsome." Kyo is not too keen on the idea of Saki as his "mother."